What in the name of Jim Rose Sideshow is going on here? 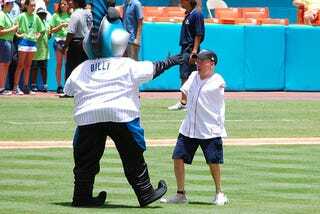 One reader suggested that this armless gentleman "threw out the first pitch" at a recent Marlins game but that seems highly unlikely. If so, please send video. We'll update. Okay, so this is Tom Willis, motivational speaker and proprietor of Tomsfeet.com. And, yes, he throws out first pitches with his feet. That's a ball. Still? Better velocity than Jamie Moyer.